Mosley reportedly says he won't seek sixth term as FIA President. Again. Finally. Could the end finally be at hand for the Max Mosley/Formula One soap opera? The embattled FIA president has apparently backed away from potential threats to seek a sixth term in office after all, instead deciding to endorse Jean Todt, team principal for Ferrari's F1 team. 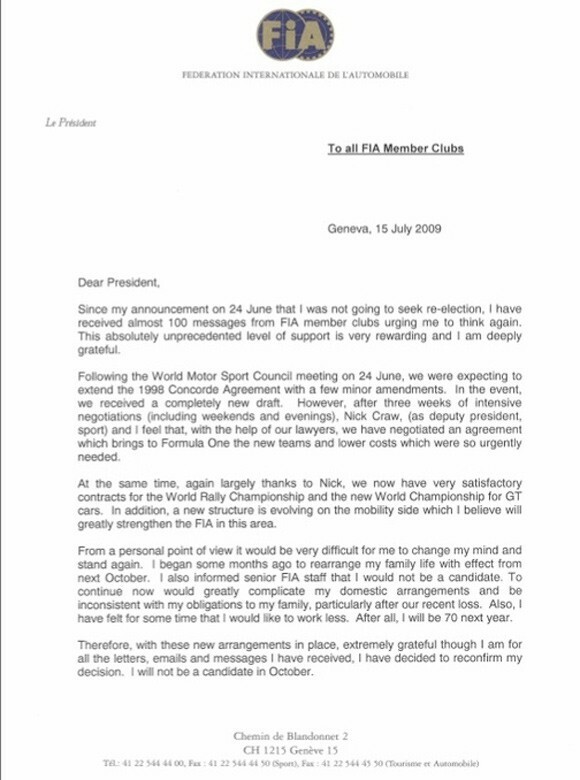 The announcement came as part of a letter sent Wednesday to all FIA member clubs. "Extremely grateful though I am for all the letters, e-mails and messages I have received, I have decided to reconfirm my decision. I will not be a candidate in October... To continue now would greatly complicate my domestic arrangement and be inconsistent with my obligations to my family, particularly after our recent loss. Also, I have felt for some time that I would like to work less. After all, I will be 70 next year." Despite not seeking re-election after 16 years, Mosley will apparently still maintain a seat on the FIA Senate. For his part, Todt, 63, has not yet indicated that he is interested in running for the position, but if he decides to do so, he will be campaigning against ex World Rally champion Ari Vatanen, 57, who reportedly announced his candidacy last week. 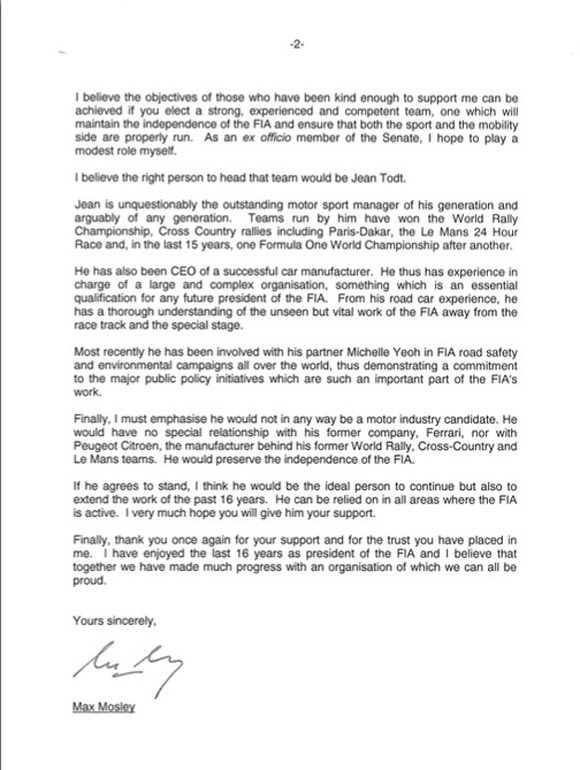 Check out a copy of Mosely's letter to FIA members after the jump.